While sustainable mobility is recognised as one of the keys to social and economic development, our roads are becoming increasingly congested, road transport has negative environmental impacts and more and more cars need to be accommodated. According to the International Road Federation (IRF), a pivotal response to this dilemma lies in the increased deployment of Intelligent Transport Systems (ITS). These have the demonstrated ability to improve the efficiency, safety and quality of mobility. Since the first edition in 1964, IRF annually produces the largest compilation of road statistics in the world. This year's edition includes data from over 200 countries, collected from primary statistical sources worldwide. The World Road Statistics or WRS in short, are the leading reference source for road industry leaders, analysts and international organisations. 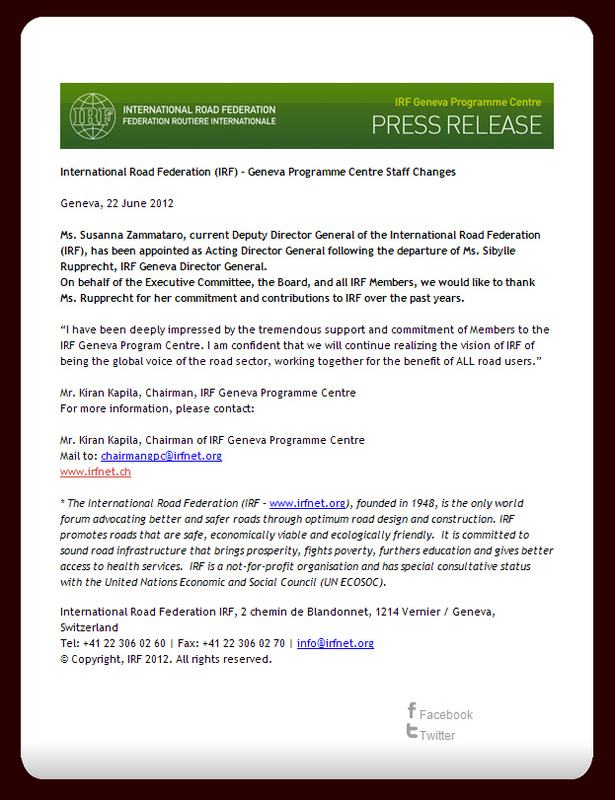 Ms. Susanna Zammataro, current Deputy Director General of the International Road Federation (IRF), has been appointed as Acting Director General following the departure of Ms. Sibylle Rupprecht, IRF Geneva Director General. We, the undersigned, are organizations working nationally and internationally to prevent road traffic injuries. Every six seconds someone is killed or seriously injured on the world's roads. Nine in ten of these casualties occur in low-income and middle-income countries, where traffic levels are rapidly increasing. This is a human, economic and environmental disaster. And it is preventable. This year's Intertraffic Amsterdam exhibition saw a major new technology launch by the IRF Geneva Programme Centre and IRF India Chapter. A unique event 'Celebrating Achievement' provided a high-profile backdrop for the unveiling of RADaR, a pioneering new tablet application developed to facilitate the on-site collection of precise and scientific accident data, primarily by traffic police. At an emotional ceremony, packed with IRF friends and delegates from all over the world, and in the presence of H.E. Mahmoud Samy, Ambassador of the Arab Republic of Egypt to the Netherlands, the IRF Personality of the Year Award for 2011 was formally presented to Dr. Essam Abdel-Aziz Sharaf, the former Prime Minister of Egypt, on Wednesday 28th March. India reports the maximum deaths in road accidents. To reduce them, private companies must be given tax benefits to work on road safety projects, writes KK KAPILA. India leads the world in road accidents, an area where it is far more desirable to be a laggard. India reports the highest number of deaths due to road accidents: in 2010, around 1.33 lakh people died while around 50 lakh people were injured in such accidents. Every day, 360 persons, the equivalent of a full load of a Jumbo jet, are killed in road accidents in India.